Are KbPort™ Simplicity™ solutions scalable from a basic to enterprise level? Yes. KbPort™ Simplicity™ solutions are scalable from any level. We also offer custom programming and engineering services to extend and tailor our solution to specific facility needs. Are KbPort™ solutions environmentally friendly? Yes. KbPort™ has the most environmentally-friendly system available, utilizing patented software that eliminates hardware required in typical simulation environments. Compared to other systems, KbPort™ Simplicity™ solutions offer reduced costs, space, heat, and man hours by an estimated 60%. Are KbPort™ systems cross-platform compatible (MAC/PC)? KbPort™ Simplicity™ solutions are installed on-premise and can be accessed directly, however, these systems are also accessible from any client machine (with any modern OS) on your network, via any modern browser. 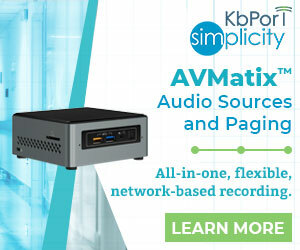 Can KbPort™ export videos in AV formats other than your proprietary format? Yes. 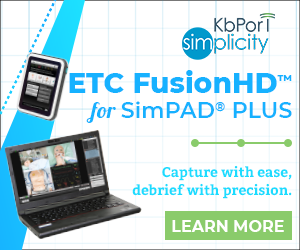 ETC FusionHD™ and Archiver™ can export video in KbPort™ native proprietary format, .MOV, and mp4. 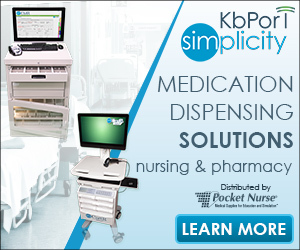 Can KbPort™ integrate with automated medication devices (AMDs)? Yes. We integrate with our own AMDs: SimCartRx™ and SimCabRx™. Can KbPort™ integrate with our current electronic health record (EHR)? No. We offer our own EHR solution, SimEMR®, that integrates with our ETC FusionHD™ recording and debriefing systems and our AMD products: SimCartRx™ and SimCabRx™, offering the most advanced and complete training tool in the market. Can KbPort™ record standard and HD quality video? Yes. KbPort™ solutions are compatible with both standard and HD cameras. Do KbPort™ solutions require racks full of AV hardware with a dedicated cooling system? No. Our software eliminates the need for most hardware. Do KbPort™ systems offer live video in real-time? Yes. All digital computerized systems will have some type of latency, however KbPort™ offers solutions with near zero latency (milliseconds), which can be considered real time. Do KbPort™ systems provide synced audio and video during live and playback sessions? Yes. ETC FusionHD™ recording and debriefing solution was the first system in the industry to provide synchronized audio and video streams. Do KbPort™ systems require annual licensing or maintenance fees? No. 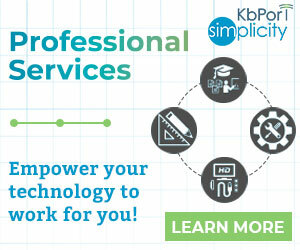 KbPort™ Simplicity™ solutions do not require annual licensing or maintenance fees. Do KbPort™ systems require expensive AV switchers/controller processing equipment? No. Our software eliminates the need for additional hardware, such as Crestron or AMX. Does KbPort™ offer inventory management, scheduling, and assessment solutions? Yes. KbPort™ WorkFlow™ offers course management, scheduling, assessment, and reporting as well as inventory and resource management. Does KbPort™ offer online demonstrations? Yes. We typically like to start with an on-line consultation and demonstration of our various solutions. It is quick, extremely efficient, and cost effective. Since our system is web based, we can demonstrate it via the internet. We also understand the importance of face to face meetings and do those as well. We do not do PowerPoint demonstrations. Because of our simple design, we can demonstrate our solution onsite. Does KbPort™ offer recording and debriefing systems for mobile, space saver, and rack server applications? Yes. We can meet all of those requirements. KbPort™ is a leader when it comes to mobile applications, while our other solutions provide the smallest footprint in the industry. Yes, KbPort™ offers the Technology Management Plan™ (“TMP”) to manage and support your purchase. We designed the TMP to support your center as well as to provide you with a care plan that fits your budget and needs. Unlike traditional warranties, KbPort™ TMPs provide tangible long-term value as they are crafted specifically to mitigate technology obsolescence and minimize productivity loss related to downtime, staff turnover, and under-utilization. KbPort™ TMPs are available in 3 levels: Basic, Enhanced and Perpetual. Please visit our Technology Management Plan™ page for more information. Does KbPort™ provide automatic updates and support services via the web? Yes. KbPort™ provides administrators with complete control of how and when on-premise systems are updated, offering one-click updating directly from your systems or via our downloadable offline update software. Does KbPort™ provide global support? Yes. We have distributors in several countries around the globe and can remotely support our products in any geographic location (with an available internet connection). Does the KbPort™ solution need a scan converter to capture patient monitors? No. KbPort™ systems do not need a scan converter to capture patient monitors. We capture patient monitors digitally across the network, using KbPort™ SimLink™ software, eliminating 3rd party hardware. Yes. Our system utilizes 256-bit encryption when SSL is enabled. Will KbPort™ subcontract any part of the solution? No. KbPort™ offers consultation, design, installation, training, and support services for the entire solution.